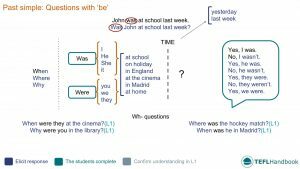 An ESL lesson plan for teaching elementary level students how to form past simple questions using the verb 'to be'. This lesson plan includes a lead-in activity, along with several group activities and games suited for low-resource classrooms. The best way to view this content is through the TEFL Handbook app. So if you have an iOS or Android device, be sure to check it out. The board work below offers one suggestion on how to present the grammar of the target language. Start off by giving a very basic past simple statement and attempting to elicit how we change the sentence to make a question. 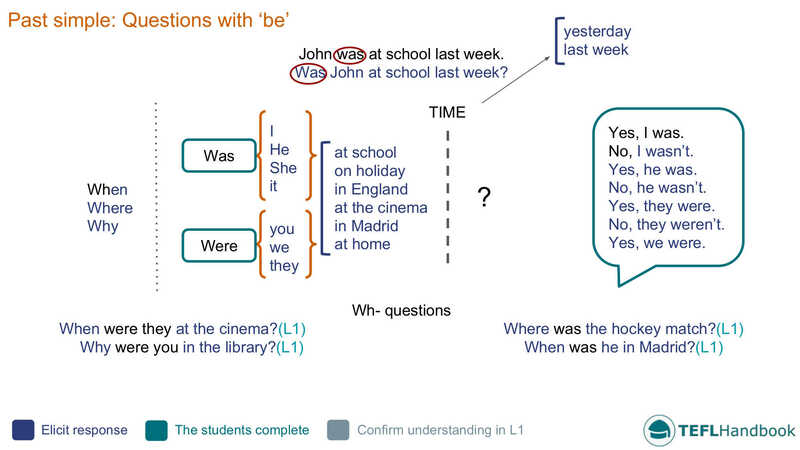 After that, move onto the visualisation of how we form questions that begin with was or were, the colour-coded text gives you an idea of what you should be attempting to elicit. Next cover a few examples of short answers, elicit one for each example you put on the board. Finally, demonstrate how we can combine these structures with question words to form more complex and interesting questions. If possible, compare and contrast with the L1 of the class. 1. We ____in Scotland last year. 2. The hotel ____ very nice. 3. It____ near the beach. 4. The weather ____ very good, it rained a lot. 5. There ____ a lot of activities to do, so I was bored. Using these, students will write questions that they can use to interview their partner about their last holiday. Depending on the amount of practice needed, between three and six should be fine. We follow on from the previous writing task with this speaking activity. The students will interview each other using the questions they made earlier. Monitor for the correct usage of the target language and correct any mistakes. Students will have to report back in the third person singular. Using the prompts from the 'holidays' activity, quiz each student about their partner's holiday. Here are a couple of games that English teachers can use to practice past simple questions. As usual, our suggestions require the minimum of resources (whiteboard, markers and some students). Now, select two students to be the suspects and also each other's alibi. Inform them that they will have answer questions about what they were doing at the time of the crime. Before sending them away to get their story straight, elicit where they were at the time of the crime for all the class to hear (zoo, cinema, theme park, football match). Send the suspects off and instruct the rest of the class to come up with a list of questions that they will use to interrogate the suspects. Help the students with their questions, correcting them as necessary. Bring the first suspect back to answer the questions while the other either leaves the classroom or listens to some music. Once the first suspect has answered all of their questions, bring in the second suspect. If the stories match, they are off the hook. If not, guilty. We hope that you were able to grab a few ideas from this lesson plan. Our suggested next lesson focuses on using some and any. Be sure to check out our full list of elementary ESL lesson plans, A2 lower and A2 upper. For a broader range of language levels, you can browse the complete collection.